SAN ANTONIO, TX, 2017-Nov-29 — /Travel PR News/ — San Antonio has been named to National Geographic Traveler magazine’s annual lineup of the 21 must-see destinations to visit in the year ahead. The 2018 Best of the World list, comprised of Traveler editors’ top picks, is available today in the December/January 2018 issue of the publication, on newsstands and online at NatGeoTravel.com/BestTrips2018. San Antonio, which draws more than 34 million visitors a year, was one of three U.S. destinations listed. Also honored were Cleveland, Ohio, and Oahu, Hawaii. San Antonio will be celebrating its 300th birthday throughout 2018, including a kickoff celebration on New Year’s Eve. It has recently enjoyed a string of notable accolades, including recognition from Conde Nast Traveler, Fodor’s and Frommer’s, all naming the city as a must-visit destination. In October, Travel + Leisure named San Antonio one of the friendliest communities in the country. Already home to the only World Heritage Site in Texas, San Antonio also was honored earlier this month when UNESCO named it a Creative City of Gastronomy for its mix of culinary cultures. San Antonio is only the second U.S. city to receive this recognition. National Geographic Traveler has the largest audience of any travel magazine, with more than 9.6 million readers. 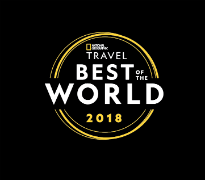 Its readers have the highest passport ownership, most international and domestic trips and most outdoor recreation spending of any other travel title. This entry was posted in Tourism, Travel, Travel Management, Travel Marketing, Travel Services and tagged George Stone, must-see destinations to visit in 2018, National Geographic Traveler, san antonio. Bookmark the permalink.